If you’ve had the chance to do some traveling then you know that the journey often includes sampling local food and delicacies along the way. If you haven’t had the opportunity to venture outside of the country, that doesn’t mean you can’t find ways to experience different cultures that are rich in foods. We’ve put together a list of popular appetizers from around the world for you to try all within the comfort of your own home and wow your guests with a unique selection of international appetizers at your next party. Georgia is a country nestled in the Caucasian hills with a rich cultural history and an equally rich cuisine that has been developed over hundreds of years. Famous for its pickles – pickled tomatoes, pickled cabbage and Jonjoli – a lesser known appetizer consisting of pickled grapes in tarragon. 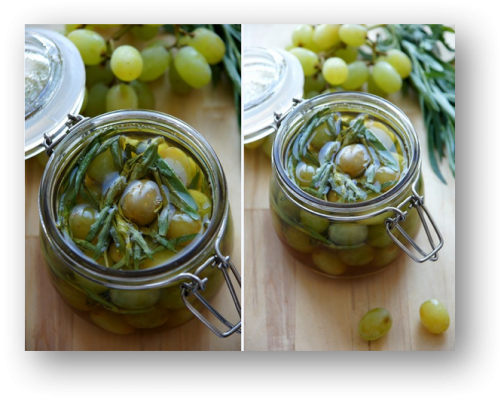 The grapes are pickled in honey, sugar, salt, vinegar, and tarragon for a couple of weeks and are often eaten on their own or mixed into salads. The sweet and tangy taste makes it an unusual but delectable delight. Try pickled grapes on crackers paired with a creamy cheese as an appetizer. 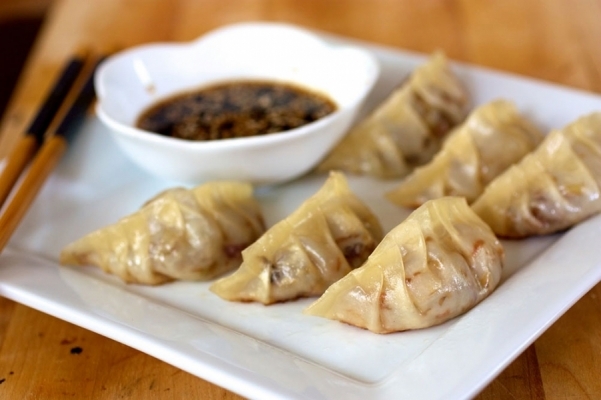 Potstickers which originated in China, are essentially pork dumplings that have been lightly fried to make them crisp. According to legend, their origin was a mistake. And what a good mistake we say! A chef forgot about his dumplings on the stove. When he returned, all the water had boiled away and the dumplings were crisp from the heat and stuck to the pan, hence the name ‘potsticker’. Stuff your dumplings with pork and vegetables, along with shitake mushrooms to add that extra punch; fry them lightly in oil before serving them hot. Alternatively, try our Pork Potstickers here. 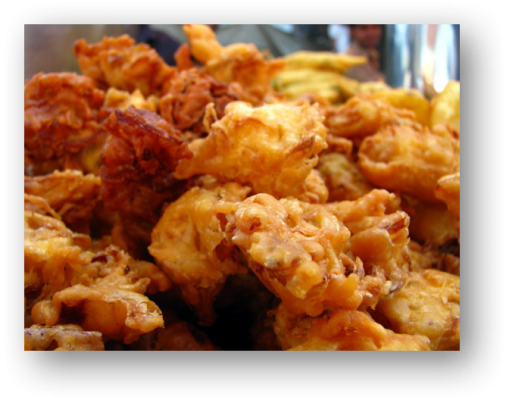 Pakoras are savory vegetable fritters from India and Pakistan. Sliced vegetables like onions, cauliflower, potatoes, and spinach, are coated in a mildly spiced batter made from chickpea flour and deep fried until they turn a golden brown. If you’re feeling adventurous, try making pakoras from mild green chillis, although we must warn you, they aren’t for the fainthearted! Pakoras make great appetizers on a rainy day. These Latin favorites are mini meat pies. Their origins are lost in time but are especially popular in Chile and Argentina. They are made from a variety of fillings, from pumpkins to seafood and eggplants to beef. 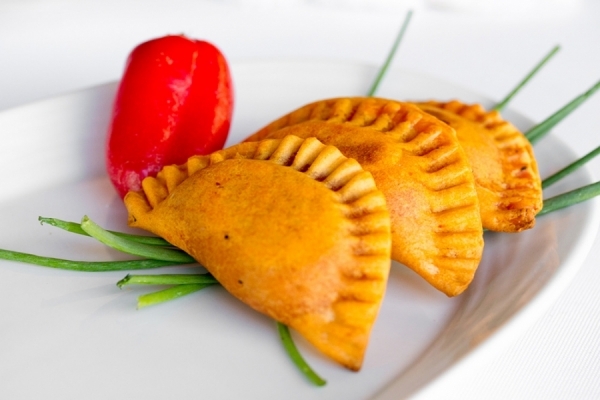 Stuff your empanadas with your filling of choice or make empanadas with a variety of fillings to truly amaze your guests with your culinary skills. These little pies are truly heartwarming on a cold winter’s evening. 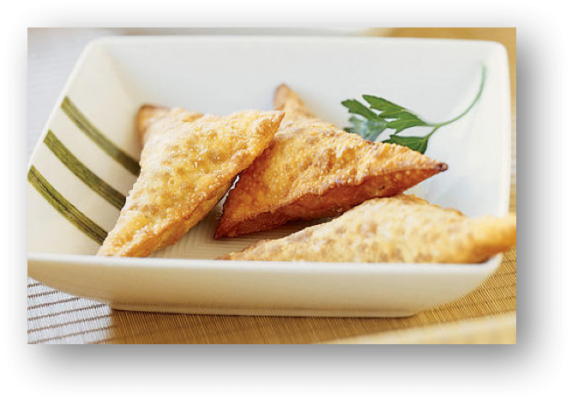 Try our selection of empanadas here. 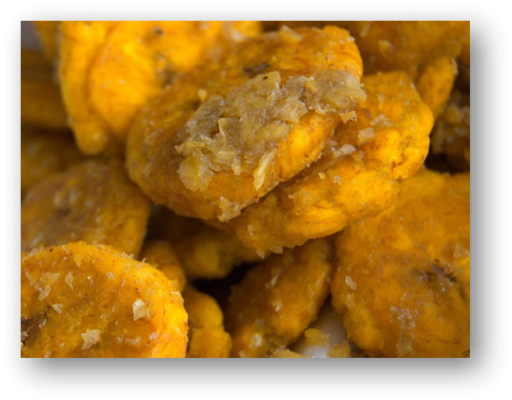 Tostones are a popular snack throughout the Caribbean Isles. Known as tostones in Puerto Rico, Cuba, and the Dominican Republic and patacones in Ecuador, Peru, and Venezuela, they are made from fried plantains. This popular Swedish appetizer is much easier to make than it is to pronounce! Västerbottensost is a strong flavored, hard Swedish cheese. It is available in specialty supermarkets or you can substitute high-quality, mature cheddar instead to make this popular little appetizer. Oliver is, well, olives. The cheese is kneaded into the dough along with flour, water, and cayenne pepper. Pieces of the dough are wrapped around warmed olives. 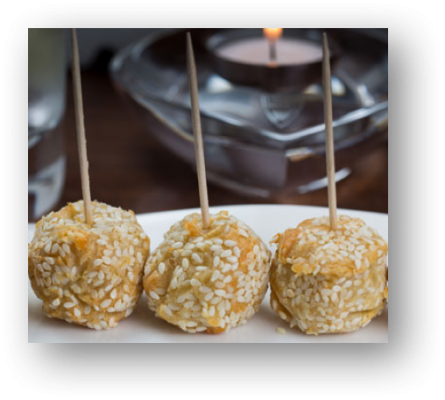 The little balls of dough are then coated in sesame seeds and fried. Your guests will find that the olive centers come as a pleasant surprise. 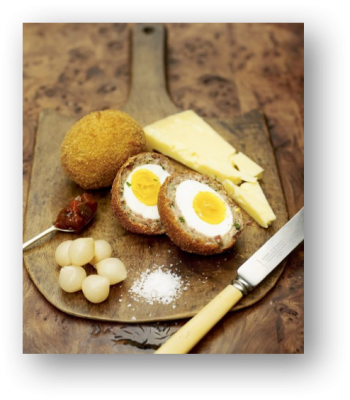 As the name suggests, scotch eggs are a popular appetizer in Scotland. You’ll find them being served in pubs, at supermarkets, at the local fish and chip shops. Scotch eggs have a crispy coating on the outside and a soft interior with a warm runny yolk in the center. They can also be eaten cold, making them a great appetizer to carry along on a picnic. Pair them up with a tomato pickle and good quality cheese and you cannot go wrong. Potatoes are always great appetizers and these pastries from Tunisia, stuffed with potatoes can definitely hold their own amongst all the dishes out there. The brika are light on the stomach, unlike many potato dishes and are really easy to make. A mixture of mashed potatoes, onions and spices are wrapped in egg roll wrappers and fried until golden brown. You can also make them as a unique spin on the traditional latkes for Hanukkah. Set the tone for your party with our selection of hand-crafted gourmet appetizers. Our customer service team is always ready to help you plan your menu and make your party a success.